Orange Honeydew… Who Came Up with This? Can I Kiss Them? When we lived in Indiana, I loved our local farmer’s market. There was a vendor that sold bratwurst and pork patties, which would always become lunch when I returned. We’d also have fresh corn from “My Dad’s Sweet Corn,” picked that same day. And I would get the best cantaloupe in Indiana. Here’s the secret: Indiana has the nation’s best cantaloupe. And tomatoes. Lunch of the gods, people, no lie. The family had to try a new fruit today, because I wanted to. So there. Eat up, everyone! I’m pretty sure this is is an Orange Honeydew… whatever it is, OH MY GOSH, IT’S DELICIOUS! There’s a cantaloupe in the background for size comparison. This was worthy of serving with the bratwurst. The Husband: This sure doesn’t taste like a cantaloupe. Me: (finally tasting the melon) This is good… (another bite) Holy COW, this is DELICIOUS! The Boy: It’s good (high praise from a 14-year-old). Good grief, this is a great fruit. 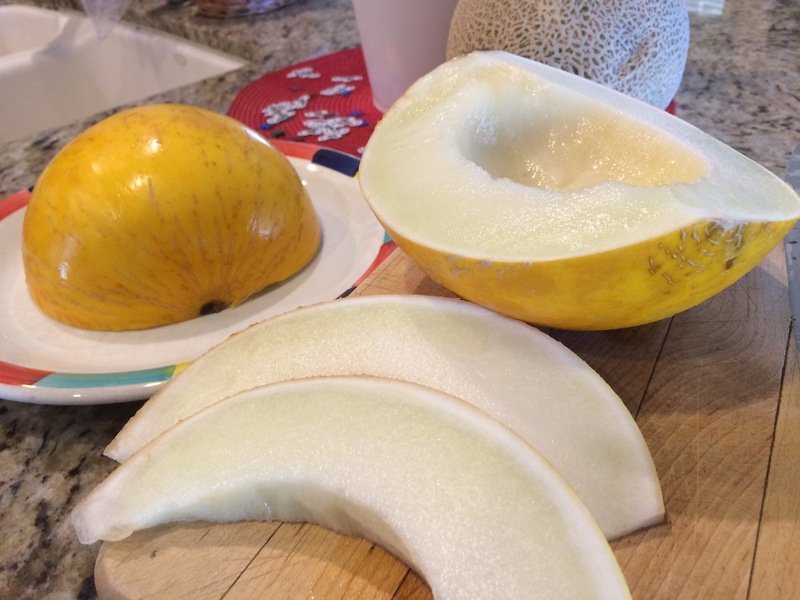 It kept forever on the counter -like two weeks- and was still crisp, and one of the sweetest melons I have ever tasted. 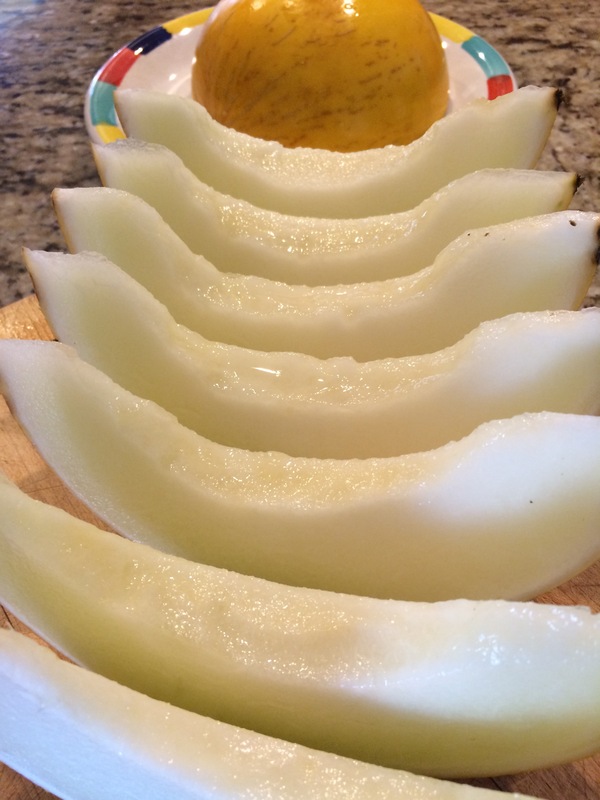 Golden Honeydew has a very light texture, is more crisp than a regular honeydew, and is ultra-juicy with a sweet, sweet perfume-y and floral flavor. Really. I’m not making this up. Go get one, you’ll see. 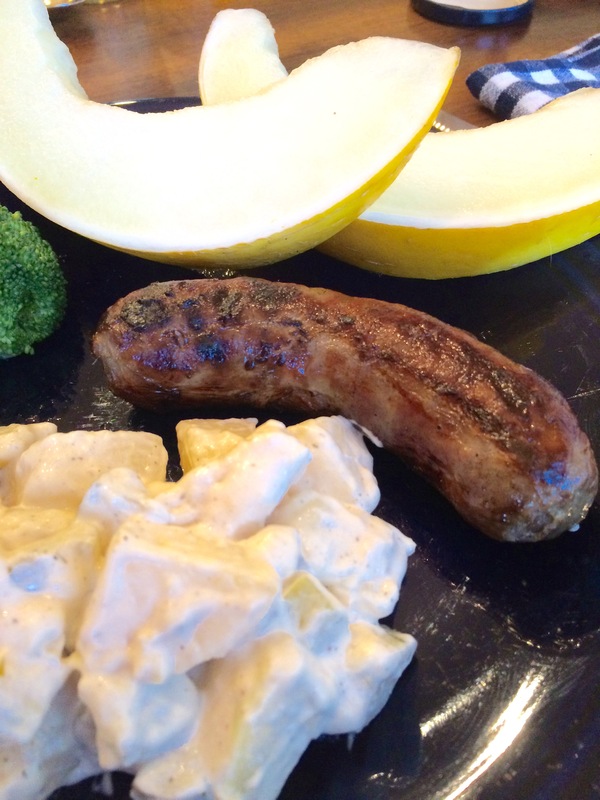 Great with our favorite, bratwurst! Previous Previous post: Uplifting Stuff and a BIG HALFTIME SHOW! Starring Pharrell, Bruno, and more! Next Next post: Did You See the Strawberry Moon?